One thing I learned fairly quick upon the release of the Springfield XD was this. "Everyone is a critic". Especially Glock fans. Now I will not even make the slightest inclination that Glock is not a fine weapon. This much has been proven. I see no need for redundancy which is why I have not reviewed any Glock model to date. Glock is a fine pistol indeed. The problem with the Glock and many other firearms is the simple fact that not everyone likes it. While it may work for some, it does not work for all. Personally, I am not real fond of the way Glocks point. I am also not very big on the trigger. Even worse I don't like the way it looks. Be that as it may, I do own one. I have grown accustomed to the trigger on my G20SF over the years, and with practice I am able to shoot it quite accurately. Practice makes perfect. Glock can be found in duty holsters around the world and with valid reason. It does perform, and exceptionally well. So if I didn't like it, why did I buy it? One simple reason. The Glock 20 is best platform for which to launch the 10mm cartridge. It is reliable, accurate, and comfortable to shoot. Hell aside from that, everything else is mere preference. If you want a firearm that works every time and all the time, Glock can not be beat. But this review is not about the Glock. It is about the gun that is supposed to out do it. As it stands, I was indifferent about putting my hands on an XD. I had heard it all. The XD is better than Glock, the XD is as reliable as Glock, the XD has a better trigger than Glock, the XD turns into a Jumbo Jet and can fly you around the world in 10 seconds flat. Well... that was all great and dandy, but like I said I am content with my Glock. I own a Glock because of what it is, not because of what it can be. But hey, I'm open minded and this is my job, so I gave it go. First thing I noticed was the grip. It doesn't have a finger serrations like the Glock does, but it feels good in my hand. Actually... scratch that... it feels really good in my hand. Springfield Armory obviously paid attention to this detail. The back of the grip has a 1911 style safety, where as when you grip the gun the safety is pressed without effort. (see pic above) It also sports the same "Glock style" trigger safety. The frame is made from polymer and has no funny edges or burrs on it. It feels smooth and well made. The slide is made from forged steel and the double stack mags from stainless steel. 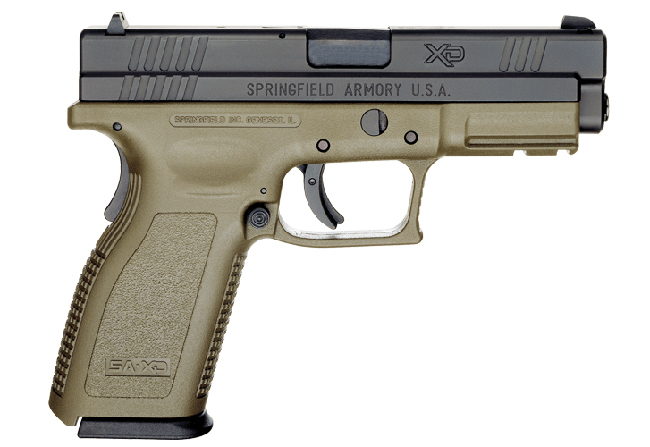 The claimed dry weight of the Springfield XD 40 is 29 ounces. It is slightly heavier than the Glock 20 (27 ounces), but it is not noticeable to any degree. Size wise the SIG Pro 2022 and the XD 40 are very similar. Actually the SP2022 fits in the XD holster perfectly. The XD also wears a 1913 picatinny rail for a tactical light or other accessories to suit. 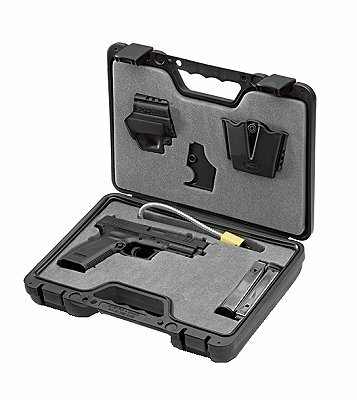 The Springfield XD comes in a nice plastic case which contained the firearm, 2 mags, magazine holster, firearm holster, gun lock, and mag loader. I think it's pretty cool that Springfield includes the extras. Not having to spend additional money to outfit this firearm is a nice touch and allows extra funds for trigger time. The double stack mags are capable of holding 12 rounds of 40SW. The Barrel length of the XD 40 is 4". It has a fully supported ramp and is made from steel with a Melonite finish. The 3 dot dovetailed sights are decent enough and it is easy to acquire the target. The sights sit fairly low to the slide to avoid snagging when drawing the firearm. The gun points exceptionally well. It was very natural. This is a big plus for me, as I do not like the Glock point angle. Dry firing thegun, the trigger feels very nice. The trigger on this gun measured 6.1 lbs. but to be honest it feels more like 4 lbs. Smooth as a baby's bottom, the length of trigger pull is perfect for a double action only gun. The trigger does not stack, and breaks clean. Springfield did a superb job in the trigger department. Keep in mind, this is a striker fired pistol so there is no pulling the trigger more than once without re-cocking. I knew that if the XD was gonna live up to Glock standards, it had better perform flawless with any ammo on the menu. We brought along everything we could get our hands on. Blazer, Federal, Cor-Bon, Double-Tap, Winchester, Glaser, Remington, you name it. The rounds were Hollow Point, Flat Nose, Safety Slugs & FMJ. With respect to rumors stating the Springfield XD is poised with "Glock Reliability" I strongly insisted that we randomly mix various types of ammo in the magazines and go to work. GAME ON! I noticed fairly quickly that the sights on the XD 40 are a traditional 6 O'clock set up. Aim just below the area you want to hit. Or rather, the bulls eye will rest on top of your front sight. (see pic to left) This wasn't a big problem, just a bit different than my personal combat sight picture preference. Shooting the XD 40 was really a ton of fun. I really liked the way it pointed, so I had no trouble greeting targets. This gun is very accurate for a duty pistol and the excellent trigger really helps. I felt connected and confident even after the small amount of time I spent with it. In fact we were having so much fun shooting the darn thing that none of us even bothered to measure the distance of the targets. We just wanted to set them up and knock them down, and that was accomplished with little effort from the shooter. About the recoil, or should I say, "lack thereof". For a 40 caliber pistol, the XD 40 is very plush and really handles well. The spring and frame soak up the recoil surprisingly well. This is a huge confidence booster. Recoil is very similar to that of a 9mm. In fact we shot the SIG Pro 9mm a long side and the recoil difference is barely worth mentioning. I could easily shoot this pistol all day. I was very impressed with the XD 40 and how well it fires. All in all we ran just under 1000 rounds of various ammo thru the XD 40. The one and only problem we had was a dud round. A bad primer from a greasy Blazer round. We cleared it and were back to battery. There were no other problems with feeding or failures to eject a spent casing. We did not clean or lube the gun at any point during our testing. We did not measure the guns grouping as we were treating it more like the duty pistol it is, rather than a target gun. I am quite confident however that it is as accurate as any Glock. Finding target was never an issue after I had the sites figured out. Well I think a lot of things but that is beside the point. First thing is this. I like the XD ergonomics, a lot. I like the XD sights and point angle, a lot. I also like the XD trigger, really a lot. However, I do like the higher mag capacity the Glock touts as well. All in all, if bang for your buck is the goal, the Springfield XD really is a better buy. The additional accessories it comes with are a big plus. It is a very well built firearm, proved reliable for us, and was a joy to fire. I have no doubt the XD can take abuse and still remain a top performer in verbatim the sinless Glock. Personally, I do not have a need for another polymer firearm. I currently own the SIG Pro in 9mm and a Glock in 10mm. But, if Springfield did make a 10mm, I would happily trade my G20 for one. Does this make the Springfield XD 40 a Glock killer? Eh... I don't think so. It just makes the XD 40 better suited for me. I would not hesitate to recommend Glock or XD to anyone. I think the XD is much like a Glock, yet also, nothing like Glock. I don't think Springfield was trying to better the Glock platform with the XD. I don't even know if that is possible. I think the goal was to create another great firearm as an alternative to Glock. Either way Springfield did a fantastic job. While the XD 40 has yet to transform into a jet and fly me around the world, it really does live up to many of the rumors I have heard. One thing is certain, I would love a bit more trigger time with the XD before it is returned tomorrow. As I write this review, the XD is sitting patiently on my desk, begging to be fondled. Empathetic as I am, I think I will oblidge. There is still daylight left and I have few hundred rounds left over. That alone should say it all. I love this gun! 28 oz. 29 oz. 29 oz. 5.5 - 7.7 lbs. 5.5 - 7.7 lbs. 5.5 - 7.7 lbs. what do you think about the springfield xd?